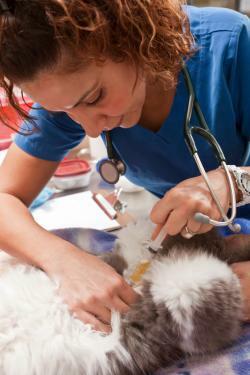 Cat urinalysis is a common and important test that a veterinarian may want to perform. The urine sample can be obtained in several ways and proper interpretation can help identify diseases and ensure that your cat receives prompt treatment. Why Does My Cat Need a Urinalysis? Urinalysis is a helpful test to evaluate several organ systems of your cat. The American Animal Hospital Association (AAHA) recommends that pets have a comprehensive set of lab tests performed once a year upon reaching middle age even if the pet appears to be healthy. This includes blood work as well as a urinalysis. For senior pets, AAHA recommends that this minimum database of lab work be performed every six months. This testing helps your vet detect medical problems with your cat early. After the urine sample is obtained, it should be analyzed promptly. If you cannot take a sample to your veterinarian immediately, refrigerate it for up to 24 hours. This is a urine sample that is obtained by catching the urine while the pet naturally urinates. It is important to be as clean as possible while obtaining this sample, and this technique may not be appropriate for a urinalysis in all situations because there is greater risk of contamination with bacteria or skin cells or debris. However, a voided sample is less stressful for your cat and has no risk of complications. For many cats, it is difficult to catch a urine sample because they squat too low in the litter box, are started and stop urinating when you try to catch a sample, or are too unpredictable in their urinary habits to catch them in the act. For these cats, you can use a non-absorbent type of litter to collect a voided sample. To do this, empty and thoroughly clean your cat's litter box before putting the non-absorbent litter in it. Once the cat has urinated, the urine sample can be poured out of the litter. Some examples of non-absorbent litter include No-Sorb or Kit-4-Kat. This technique is also called expressing the bladder, but is not usually a favored technique for collecting a urine sample. In this method, the bladder is palpated in the abdomen and steady, gentle pressure is applied until the cat releases its urethral sphincter and urinates. The sample is caught the same way you'd catch a voided sample. Manually expressing the bladder can be painful and can cause stress to your cat. It may be needed in certain situations, but also has risks of trauma or rupture of the bladder. Because of these risks, you should not perform this technique, but rather leave it to your veterinarian. When urinary catheterization is performed, a small tube is inserted into the urethra (the hole that the urine comes out of) and advanced until it reaches the bladder. This is not typically a procedure that can be performed in a healthy and awake cat. Your veterinarian may obtain a urine sample using a catheter if your cat develops a urinary blockage that necessitates a catheter anyways. This usually requires sedation and can be particularly difficult in female cats. Cystocentesis is a procedure in which your veterinarian inserts a needle through the skin of the abdomen and into the bladder. A urine sample is aspirated back into a syringe. For many medical disorders, this is the preferred technique to collect a urine sample. This technique is commonly performed in cats, and most will tolerate it without sedation. It does not seem to be any more painful or stressful than taking a blood sample with a needle. Cystocentesis can result in a small amount of blood contamination of the urine sample, but the risk of bacterial contamination is greatly reduced. Risks associated with this procedure include trauma to the bladder or other nearby abdominal organs. If the bladder is difficult to isolate, an ultrasound machine can be used to help pinpoint the bladder location and guide the needle. This assessment involves the overall appearance of the urine, the color, and the turbidity or clarity. Normal urine should be light yellow and be clear to slightly cloudy in appearance. Changes in the urine color can correlate with an abnormal specific gravity or can be caused by pigments or other sediment in the urine (blood, bilirubin, crystals, cells). The specific gravity is a measure of the concentration of the urine and can vary from one sample to the next based on your cat's hydration through the day. The Merck Veterinary Manual reports that the normal urine specific gravity for a cat should be between 1.020 and 1.040. A value that is higher than 1.040 indicates dehydration. A value that is lower than 1.020 may indicate a medical problem, although this is not always the case. When the specific gravity is in the range between 1.008 to 1.012, this is called isosthenuria and can indicate impaired kidney function. Your veterinarian may want to perform other diagnostic tests or repeat the urinalysis if your cat's urine is isosthenuric. Other factors can cause isosthenuria, such as elevated glucose in the urine, certain medications, or recent fluid treatments. pH - This is a measure of the acidity/alkalinity of the urine. It can vary with a pet's diet, but changes in the pH can also be related to bladder infections or crystal formation. Protein - Normal urine should not contain any protein. If your cat's urine does contain protein, this is called proteinuria and has to be evaluated in conjunction with the rest of the urinalysis. Proteinuria can be caused by blood in the urine or a urinary tract infection, but also could be an indicator of some less common types of kidney disease. Glucose - Normal urine should not contain any glucose. If your cat's urine contains glucose, this is called glucosuria and could indicate diabetes mellitus. In some cases, stress or some less common types of kidney disease can cause glucosuria. Ketones - Normal urine should not contain any ketones. If your cat's urine contains ketones, this is called ketonuria. For a diabetic cat, ketonuria can indicate a more advanced stage of illness and should always prompt evaluation by a veterinarian. For non-diabetic pets, ketonuria can be related to fat metabolism, high protein diets, or fasting. Blood - Normal urine should not contain any blood. If your cat's urine contains blood, this is called hematuria. If the urine sample was obtained via cystocentesis, a small amount of blood contamination is not uncommon. Any type of urinary tract disorder can cause blood to appear in the urine. Bilirubin - Normal cat urine should not contain any bilirubin. If your cat's urine contains bilirubin, this is called bilirubinuria. Bilirubin is a pigment produced in the liver. Bilirubinuria can indicate liver disease or blood disorders. Leukocytes - Normal cat urine should not contain any leukocytes (white blood cells). The dipstick test for leukocytes is inaccurate in cats and should not be used to determine the presence of white blood cells. The urine sediment evaluation is a better indicator of this. White blood cells - Normal urine should not contain many white blood cells. An increased number of white blood cells can indicate infection (of the bladder or kidneys) or inflammation. Bacteria - If your cat's urine contains bacteria, this is called bacteriuria and can indicate a bladder or kidney infection. The presence of bacteria could also be a sign of sample contamination, depending on how the urine was collected. Crystals - These can form in the urine for various reasons and can even be a normal finding. The most common types seen in cats are magnesium ammonium phosphate (struvite) and calcium oxalate crystals. Cornell University provides a comprehensive breakdown of all the crystal types seen domestic animals. Casts - These are clumps of cells or substances that have taken the shape of the tubules in the kidneys. These are not usually seen in normal urine. Numerous types of casts can occur. Urinalysis is an important test for your cat. Although it can be tough to obtain a sample, evaluation of the urine can help identify kidney disease, diabetes mellitus, or infections of the bladder or kidneys. With this diagnostic tool, your feline friend is more likely to get quick treatment and be on the road to recovery soon.